Sooooooooo, I'm still sick enough that I'm not right for visual consumption. I'm super bummed because I was REALLY looking forward to this FF post. 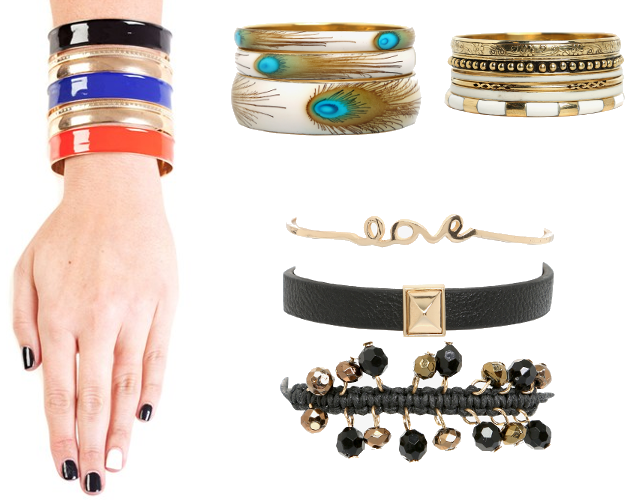 I'm a serial bangle stacker- I love me some arm candy! But, seeing as I have barely had the energy to get out of bed the last few days, outfit photos were seriously out of the question. So, instead of totally sitting this week out, I thought I'd show you some of my favourite places to buy bangles! I'm not going to lie about it. I often have an issue with 'regular' sized bangles and bracelets. As much as I love Diva and eQuip, its rare I can squeeze my wrist into their arm jewellery- unless its the stretchy kind. Don't get me wrong, its always worth trying, there are definite gems around. But, when I want a guaranteed comfy fit- especially for layering and stacking, Torrid and City Chic always bring up gold! 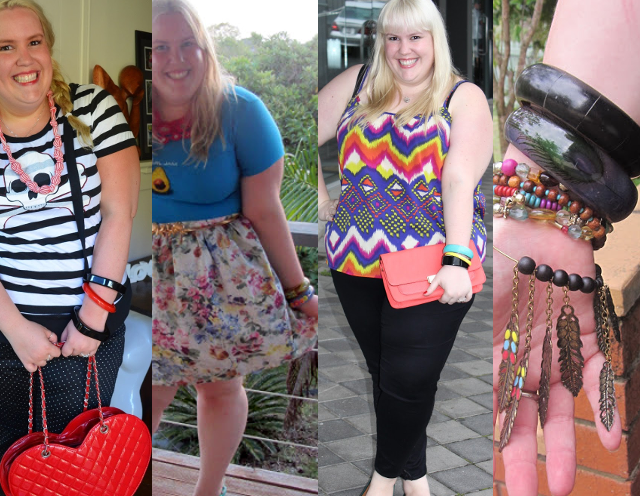 And just so I don't feel like a totally horrible blogger, I've added some piccys from when I've bangle stacked in the past, check it out here, here, here and here! I promise I'll be back to normal posting ASAP! In the mean time, make sure you check out my FF babes! Feel better! I have a hard time finding bracelets and bangles as well and I love them. Etsy is a great place to find cute large and xtra large sized bangles as well as QVC, of all places, their rings usually go up to size 10 or 11 too. Hope you feel better soon! I loooove the bracelets you posted and you always accesorize so wonderfully.